It wasn’t Santa and his elves. But on this Christmas these visitors brought just as much excitement as McNary’s boys basketball team arrived carrying gifts for a local family in need. Ryan Kirch started the adopt a family program six years ago when he became the head coach at McNary as a way for his players to develop leadership and character. Kirch gets the name of a family and their wish list every year from Dayspring Fellowship Pastor Larry Grine, whose son played for the Celtics. 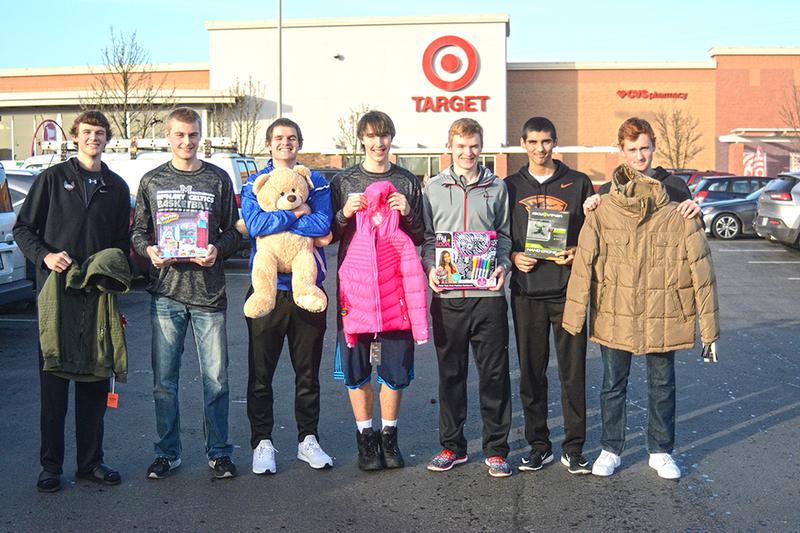 With a $250 budget, the team did most of the shopping on Tuesday, Dec. 20 at Keizer Station. They bought each kid—a 13-year-old boy and nine and 11-year-old girls—a jacket and gloves. Their other purchases included an iPod shuffle, drone, stuffed teddy bear, coloring backpack, Shopkins, boxes of macaroni and cheese and cans of soup. The players then wrapped the gifts themselves and delivered the presents on Wednesday, Dec. 21.